Experience the new Holiday Inn Express San Diego Rancho Bernardo hotel. Located off I-15, guests will appreciate being minutes from San Diego Zoo’s Safari Park, local wineries, golf courses as well as a short drive from San Diego International Airport, the Convention Center, Downtown (Gaslamp District), SeaWorld, San Diego Zoo, LEGOLAND, world famous beaches, and many other popular area attractions. Experience luxurious accommodations and a plethora of amenities including plush new bedding, refrigerator, a complimentary hot breakfast buffet, free wireless internet, business center, fitness area, and an outdoor heated pool / whirlpool. 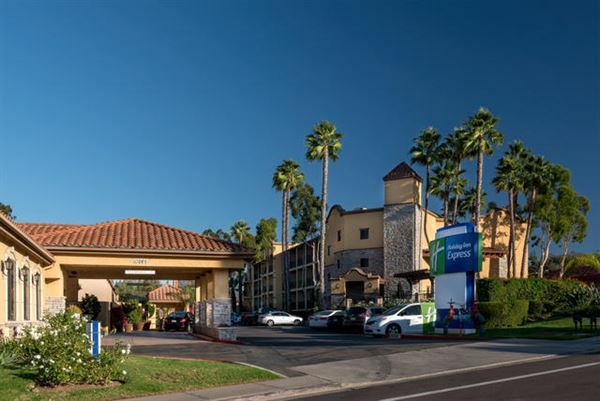 Guest will enjoy free parking and complimentary corporate shuttle service to nearby businesses within 5 miles. Enjoy San Diego’s wonderful climate from your private balcony which is available with most rooms. We have a variety of suites that feature one or more of the following: Private whirlpool, microwave, refrigerator, kitchenette, bi-level loft, and separate living area with sofa bed. Located on Level B, third entrance of the main building. This spacious and private space is perfect for meetings, birthdays, receptions etc.